A hand-coloured print from the Fiebig Collection: Views of Calcutta and Surrounding Districts, taken by Frederick Fiebig in 1851. 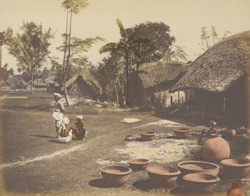 This is a view of a cottage-industry pottery works in a district of Calcutta with wares on show. Little is known of Fiebig’s career beyond his work as a topographical artist and lithographer in Calcutta in the 1840s. In the late 1840s he took up photography and this early hand-coloured print is one of over 500 views of India and Ceylon taken by him in the early years of the following decade. Among this work, some 250 of the photographs relate to Calcutta and form the earliest extensive photographic documentation of the city, made at a time when photography was just starting to supplant the engraving and the lithograph as the dominant medium of visual record.